What is the gold silver ratio? Gold price divided by the silver price. What is the Gold / Silver ratio? 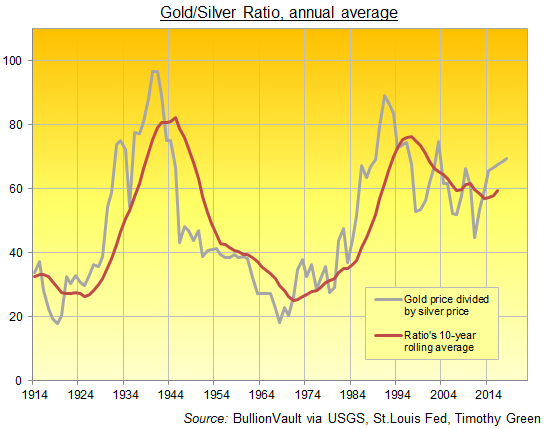 The Gold/Silver ratio measures the relative strength of gold versus silver prices. It shows how many ounces of silver it takes to purchase one ounce of gold. To get this number, divide the current gold price by the current silver price. This gives you the Gold/Silver Ratio, a simple way to check which of the two major precious metals is gaining value relative to the other. When the Gold/Silver Ratio rises, it means that gold has become more expensive compared to silver, and the cheaper metal might offer better value. When the ratio falls, it means gold has become less costly relative to silver. Some analysts, traders and investors look to "trade the ratio", buying silver when the Gold/Silver Ratio is high and switching to gold when it falls. Which factors influence the gold-to-silver ratio? Gold and silver prices generally move in the same direction day-to-day. But the size of their fluctuations varies greatly. Over the last half-a-century, gold has averaged a daily move of 0.5% up or down in US Dollar terms, but silver has moved more than 0.9%. That's because silver is a much smaller market than gold by value, around one-tenth the size. So the same flow of cash, in or out, will hit silver prices much harder, and that will move its ratio to gold prices down or up. Because of the silver market's size and volatility, speculative trading in the grey metal is much heavier than gold, relative to the physical market's underlying value. Betting on silver prices via Comex futures and options now totals a notional quantity of metal 65% greater than the volume of annual silver mine output worldwide. Gold open interest in contrast is smaller than gold-mine output by 26%. Betting on silver prices through Comex futures and options has also risen steadily since the financial crisis, setting new all-time record highs in summer 2018 more than 50% greater than the last 10 years' average. Open interest in gold contracts on the other hand have held flat, and remain 25% below the all-time peak of summer 2011. Such heavy speculation in silver contrasts with its solid and steady demand from the industrial sector. Almost 60% of silver's annual demand now comes for productive uses, versus barely 10% for gold. Boom areas in recent years have been electrics, soldering alloys and especially photovoltaic cells for solar energy. After 2017's new record global spend however, the PV boom may have peaked for the time being, as China and India join Europe in pulling back subsidies for new solar panel installation. On the supply side, silver mining output is highly inelastic, because 72% comes as a byproduct of mining other metals. That makes it hard to estimate a cost of production on silver, and output will only retreat if miners wanting gold, lead, zinc or copper as their primary target pull back in response to lower prices for those metals. Throughout history people used both gold and silver as money, minting coins from these two rare and beautiful precious metals. That made the ratio of gold-silver prices a vital piece of information in every day life, because any big move away from more typical levels could cost you dearly if you took silver rather than gold coins as payment – or it could give you a windfall profit when the ratio moved back to its average! Many investors today feel the ratio should trade in line with the physical ratio of gold to silver in the earth's crust. The availability of the the two metals certainly affected their relative prices in the past. Historians reckon that gold may have been worth a ratio of 3:1 against silver in medieval Japan and 2:1 in ancient Egypt, due to the lack of domestic silver mines in these regions. Between the Middle Ages and the start of the 20th Century, the historic level of the Gold/Silver Ratio rose from 12:1 in Western Europe to settle around 16:1, albeit with large swings over time. Huge gaps also opened up with the ratio in bullion-importing regions like India – gaps which merchants could exploit for profit. Shipping gold to where it was most highly valued offered a bumper return in silver. It also helped close these geographical gaps in the Gold/Silver Ratio – a process known to modern financial traders as "arbitrage" – by improving the balance of supply and demand in each local market. Both gold and silver were widely used as coins worldwide until 1900, but that changed as the yellow metal became the primary monetary metal with the spread of the Gold Standard, led from London by the British Empire. Now setting the value of money, gold in fact began to vanish from daily currency, replaced by paper banknotes and locked inside government vaults instead. Silver coinage continued through to the 1950s and '60s in the United Kingdom and the United States. But the metal's value had no bearing on the value of money, becoming just a token like copper or nickel coins. What is the 'right' Gold/Silver Ratio? Geologists today believe silver is around 19 times more abundant than gold in the earth's crust, but modern silver mine output worldwide is only 8 times greater than gold's by weight each year. So why is the Gold/Silver Ratio so much more higher than that? The raw numbers don't explain it. Gold has traditionally been viewed as a "safe haven" by investors, especially at times when currency markets and shares are experiencing high rates of volatility. Silver on the other hand has considerably more industrial uses, so its demand depends on the health of the global economy. Unlike most other commodities however, gold isn't consumed when it is used, and because of its high value people rarely throw gold away or try to destroy it. So most of the gold ever mined in history still exists in someone's hands somewhere. One estimate in the early 2000s said the above-ground stockpile of gold could meet more than 6,600 days of demand. For silver that number was below 260, more in line with coffee, cocoa and other consumed commodities. As it is, the Gold/Silver ratio has become wildly volatile since the United States demonetized first silver and then abandoned the Gold Standard in the early 1970s, rising from 16:1 to peak at almost 100 in the early 1990s. During this period, the ratio fell – and silver grew more expensive relative to gold – when first Texas oil barons the Hunt brothers and then investment fund legend Warren Buffett purchased huge amounts of silver in the 1970s and 1990s respectively, aiming to "corner the market" in this highly useful metal. During the global banking crisis of 2007-2009, the gold price then held firm as silver sank, and the ratio peaked above 80 as Lehman Brothers collapsed. That was quickly followed by a three-decade low near 30 however, when silver spiked to its all-time record of almost $50 per ounce in 2011 amid the end of the financial crisis and a surge in demand for silver to use in PV solar cells. How can private investors buy physical gold and/or silver? If you want to trade the ratio between precious metal prices, or you just want to build a personal holding of physical gold or silver, BullionVault offers a safe, simple and easy way to buy. Open a BullionVault account today and you can claim 4 FREE grams of silver to test our service for yourself at no risk or cost.